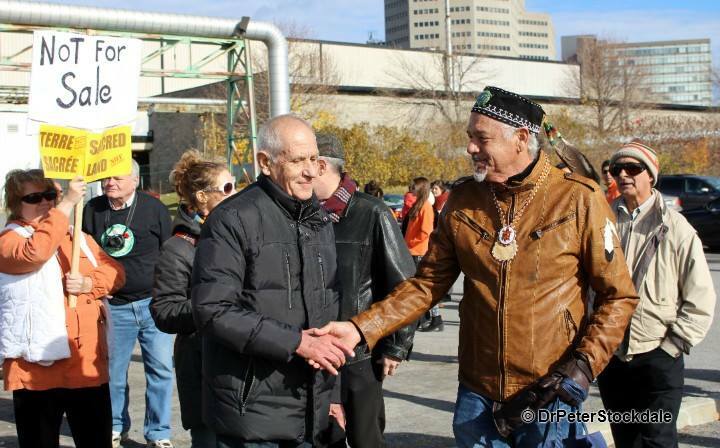 I want to clarify here and now to readers of my blog that I do not feel I was badly treated by anyone last Saturday, November 7, while participating in a protest at the Zibi condo sales site. Jeff Westeinde and Wanda Thusky were gracious, polite and exhibited no signs of disrespect to me whatsoever. I shook hands with both Jeff and Wanda. There are no ill feelings between us so far as I am concerned. (Here is the Citizen article with the video about the encounter.) I do not see the pro-Zibi supporters, whoever they are, as my enemies. They do what they believe is the best for the Algonquin Nation. It is their right to do so and I respect that fact. I ask only that my right to object is also respected by them. I wish all Algonquin Peoples well. There is no cause or issue which would ever make me condemn them. As a long time human-rights activist (since 1993), I have seen many times when the cause at hand was placed on the back burner while personal attacks, destructive to both the opposing and pro camps, took the forefront. When a cause goes into such an area it signals a mistake so great that it brings suffering even to the kind and supportive spirits in the outer world. Let us tread carefully in the future. There is no need for name-calling or personal attacks. We are, after all, a community, and however things play out with Asinabka (Akikodjiwan), we will have no choice but to live together as friends, associates, and neighbours. Let us place wisdom and tolerance in the forefront of our actions and wish each other wellness. This is a wonderful example of non-violent communication between 2 groups who may disagree but who are still able to be mutually respectful. This is a model for the path to reconciliation but at one point justice needs to be served for the Anishnaabe peoples. Thanks to Elder Albert Dumont for his message above: On Friday, November 13, this Friday at 11 am may we all gather in a good way at the entrance road to Victoria Island. To sing, to drum, to dance, to celebrate our voices being heard in the most positive way possible. To walk in solidarity for mutual equality, fairness, respect and justice for our First Nations, Inuit and Metis sisters and brothers. In so doing creating Peace. To be the peace, hope, love, and harmony we all seek as we all learn to care for, to love, to honor, and to respect each other and this sacred Earth our One home. Join us this Friday and on website to this movement inviting the world to sign the petition to Canada’s new Prime Minister at http://www.freethefalls.ca and save the islands! Tell this new government. You do not want to see concrete on these sacred unceded lands! Share far and wide! Let us welcome the world to Canada in 2017 to experience the healing and transformation of this sacred land back to its original grandeur. Working as One! Let us free the land and water and ourselves!